The sites on this page feature clip art graphics, coloring pages and scrapbooking resources similar to the quality found on this site. 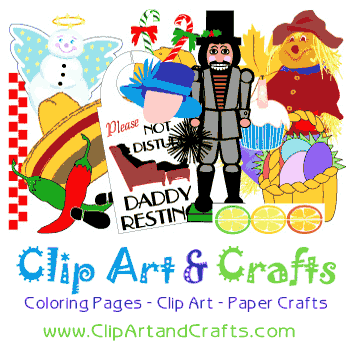 Clip Art 'n Crafts offers original clip art and public domain vintage graphics, paper craft printables, photographs and coloring pages and posters free for non-commercial use. We recommend a selected number of sites on this page that produce similar content to our original clip art, coloring pages, printables and party supplies. Follow Lee Hansen Design's Printables Board: Coloring Books & Pages on Pinterest.